1. First drain the juice from a can of Jumbo olives. 2. 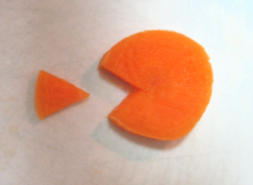 Next cut out a slice of olive. 3. Then fill with softened cream cheese. I used a sandwich bag with the tip cut off to pipe the cream cheese into the olive. (you can also just use your finger). 4. 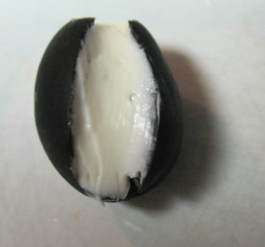 Smooth out the cream cheese and wipe away any cream cheese from the outer part of the olive. 7. 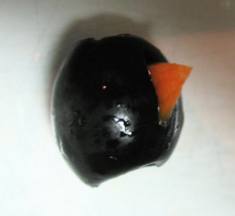 Cut a slice vertically down the long side of a small olive. 9. 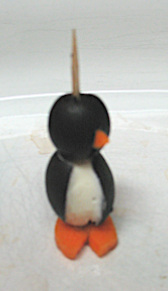 Now that you have all your pieces, just insert a toothpick through the head, body and down into the carrot feet. 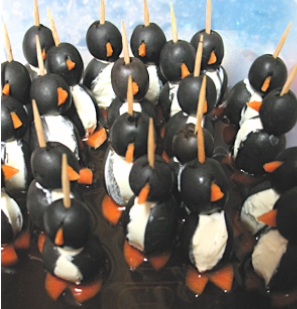 Repeat this process until you have enough penguins for your party. I found that it worked best to prep all the parts and then assemble all at once. 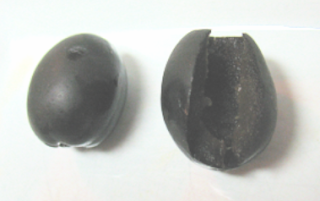 If you need to store these over night, keep them in an airtight storage container with a little olive brine. These are just too cute. Thanks so much for taking the time to make the tutorial. Oh, my gosh! These are so, so SUPER cute! LOL! I'll be making these for sure! Alright...these are just about the cutest things I've ever seen! Now you've added one more thing to my to-do list today!! :-) Thx for sharing and Merry Christmas! Looky what I got yesterday! Just the coolest albums ever!